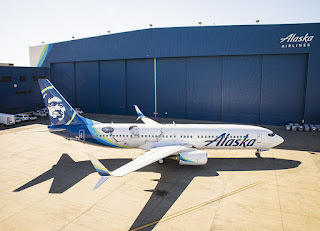 In celebration of the regular season opener and Seattle's quarterback, Alaska Airlines is unveiling a new Russell Wilson plane. Guests flying to Denver this Friday, 7th Sept, are invited to sport their blue at a tailgate-inspired celebration at Sea-Tac's C gates. "I love putting on my No. 3 jersey for the first game of the season," said Natalie Bowman, Alaska Airlines' managing director of brand and marketing communications. "At Alaska, we're excited to show our hometown pride, support our quarterback, and send fans to Denver in true football fashion." The airline's annual There's No Time to Sleep event in South Seattle's Highline Public Schools district encouraging graduates to define their goals and pursue their dreams. Before Flight 682 to Denver this Friday, fans will be treated to tailgate food, a live DJ and custom photo-booth at Sea-Tac's C gates. Upon boarding the newly outfitted plane, guests will find a party favors on their seats, courtesy of Alaska Airlines.